Extended history of file changes — 90 days instead of 14. No ads on your Yandex.Disk pages and on the pages of your public files. Priority support responds within three hours. Can I buy several packages at once? Note. If you have multiple accounts on Yandex, make sure that you are logged in to the account you want to buy extra space for. If you use Yandex.Money, you can only pay for space on the account that your Yandex.Money wallet is linked to. You can't pay for a different account using your wallet. Go to the Yandex.Disk Pro page. Choose the amount of additional Disk space you want — 100 GB or 1 TB. Subscribe for 67 ₽/month (if paid for the year) — Yearly subscription, saving 17%. It is paid once a year. Subscribe for 80 ₽/month — Monthly subscription. It is paid monthly. Bank card — Enter your Bank card details, turn on the Remember data for future purchases option and click Pay. Yandex.Money — Click Pay with Yandex.Money in the lower left corner and follow the instructions. Yes, you can buy any number of the same or different packages. If, for example, you already purchased a 100 GB package and you need 3 TB more, you can buy three 1 TB packages. 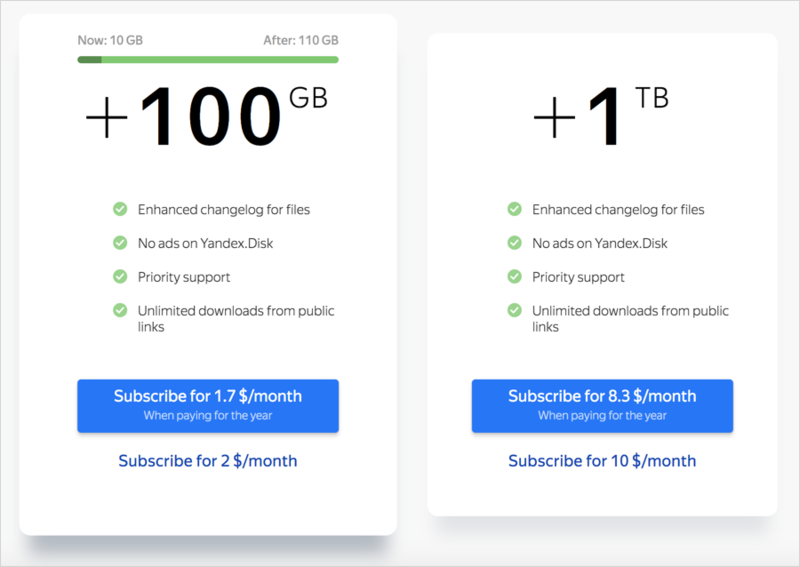 Additional Yandex.Disk Pro features are available already at the first purchase. Subscription is renewed automatically: every month or year your account is charged for the next subscription period. You can unsubscribe at any time. You can cancel automatic subscription renewal at any time on the Yandex.Disk Pro page. To do this, click the Cancel link next to the package. In this case, you can keep the space you've paid for through the end of the pre-paid period. On the Disk Pro page, you can also see the date until which the paid space is available. We will send an upcoming expiration notice to your Yandex email account close to the expiration date for your package. If you want to disable auto-renewal and then manually renew your subscription for a month or a year, click first Cancel, and then Extend. If your paid package expires, you will no longer be able to use the unpaid space. You won't be able to upload new files, share files or create shared folders. Also, the files you shared earlier won't be available for download by the public link. But they can be saved to Disk. Other actions with files are not blocked. You can still view files, download them to your computer, edit, move, or delete. To make all features available again, reduce the space you are using to the size of the available space, or purchase additional space again. To free up space, you can delete files from Yandex.Disk or move them to folders on your computer that are not synced with Disk. The majority of payment issues occur on your bank’s side. Unfortunately, we receive error messages without any additional information. Invalid credit card information. Check the credit card number, expiration date, CVV/CVC, and name on the card and then try processing the transaction again. Insufficient funds available in account. Card is inactive or expired. Your bank does not allow internet transactions. Note. If none of the reasons listed above apply to you, contact your bank's customer support to figure out why your card payment is not going through. Customer support information can usually be found on the back of your card towards the bottom. Make sure that when making the payment you were logged in to the account you want to buy extra space for. Check your mailboxes: the mailbox of the account for which you purchased extra space should contain a letter from Yandex.Disk with the receipt for the purchase. If there is no letter with the receipt or if you payed extra space for another account, contact the support service. Yandex.Disk is intended for personal non-commercial use. This means that we can't issue an invoice or receipt, or accept payment using a company credit card.